ASDs are common congenital heart defects that generally produce no symptoms in children and adolescents. However, breathlessness during exercise (dyspnea), fatigue, mild cyanosis, and/or heart palpitations may appear in the adult. 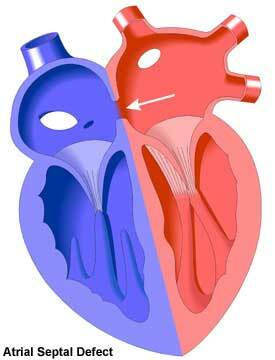 Arrhythmias may also develop, such as atrial tachycardias (rapid rates of contraction in the upper heart chambers). Congestive heart failure may result from these arrthythmias, or from other causes. Another consequence of untreated ASD in the adult patient may be pulmonary hypertension, or high blood pressure in the vessels between the lungs and the heart. This may lead to pulmonary vascular obstructive disease, especially in women. This may be serious as it can lead to mitral valve dysfunction and heart failure. For these reasons, significant ASDs always require treatment, regardless of the age of the patient. This should be done as early in life as possible as some of the symptoms caused by ASD over time are not entirely reversible. However, even elderly patients generally experience marked improvement after ASD closure. As with many congenital heart defect repairs, the earlier the ASD closure is performed, the better the long term prognosis. Heart failure, arrhythmias, and strokes occur more frequently in patients who were adult at the time of repair than in those who were treated in childhood. Because of the risk of arrhythmias developing, all ASD patients should be monitored. Small ASDs have traditionally not been treated if there is no enlargement of the right chambers of the heart. However, a possible association of these defects with stroke has raised questions about this. In some cases, treatment with blood thinners or ASD closure during cardiac catheterization is prescribed.